High frequency words are quite simply those words which occur most frequently in written material, for example, “and”, “the”, “as” and “it”. They are often words that have little meaning on their own, but they do contribute a great deal to the meaning of a sentence. Some of the high frequency words can be sounded out using basic phonic rules, e.g. “it” is an easy word to read using phonics. However, many of the high frequency words are not phonically regular and are therefore hard to read in the early stages. These words are sometimes called tricky words, sight words or camera words. In addition to being difficult to sound out, most of the high frequency words have a rather abstract meaning which is hard to explain to a child. It’s easy to learn words like “cat” and “house” because they can easily be related to a real object or a picture, but how do you represent the word “the” or “of”? Researchers believe that learning just 13 of the most frequently used words will enable children to read 25% of any text (OK, that 25% wouldn’t make much sense on its own, but it’s a very good start). Learning 100 high frequency words gives a beginner reader access to 50% of virtually any text, whether a children’s book or a newspaper report. When you couple immediate recognition of the high frequency sight words with a good knowledge of basic phonics, that’s when a child’s reading can really take off. Play bingo while reinforcing your sight words. Print out your own custom cards. 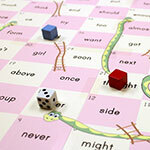 A twist on the Snakes & Ladders (Chutes & Ladders) board game. Print out your own custom boards. 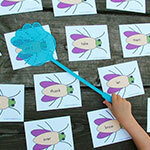 Spot your sight word, then squish it with the fly swatter. Build up speed while having fun. Hook a fish and read the word to keep your catch. 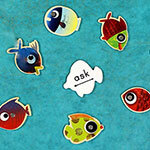 Print your own custom fish. 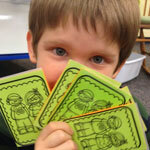 Keep a small group entertained with Go Fish while they learn their sight words. 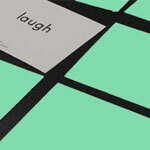 Match sight words in this classic card game. 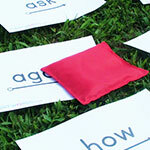 Throw a bean bag on a flash card and then read the word. 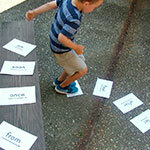 Combines sight words practice with physical activity. Park the toy car in the right spot by reading your sight words. Follow a sight words trail around the room, venturing over chairs and under tables. 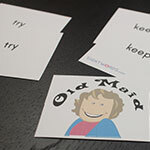 Match sight words cards, but don’t be the last one holding the old maid! A sight words variation on a classic board game. 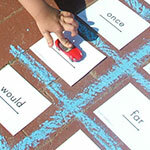 Advance through the book lands while learning your sight words. Play dominoes with sight words instead of dots. 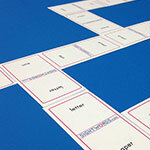 Create custom dominoes to practice a few words at a time.